•11 August 2014 • Comments Off on New Garnis Lab Publication! MacLellan SA, MacAulay C, Lam S, Garnis C. (2014) Pre-profiling factors influencing serum microRNA levels. BMC Clin Path, 14:27. Towle R, Tsui IF, Zhu Y, MacLellan S, Poh CF, Garnis C. (2014) Recurring DNA copy number gain at chromosome 9p13 plays a role in the activation of multiple candidate oncogenes in progressing oral premalignant lesions. Cancer Med, in press. •16 January 2014 • Comments Off on New Garnis Lab publication! Li G, van Niekerk D, Miller D, Ehlen T, Garnis C, Follen M, Guillaud M, Macaulay C. (2014) Molecular fixative enables expression microarray analysis of microdissected clinical cervical specimens. Exp Mol Pathol, 96(2):168-77. We would like to express our sincere thanks to the UBC Department of Surgery for its recognition of the work done by the Garnis lab. It is an honour for Dr. Garnis to receive the 2013 Hjalmar Johnson New Investigator Award. 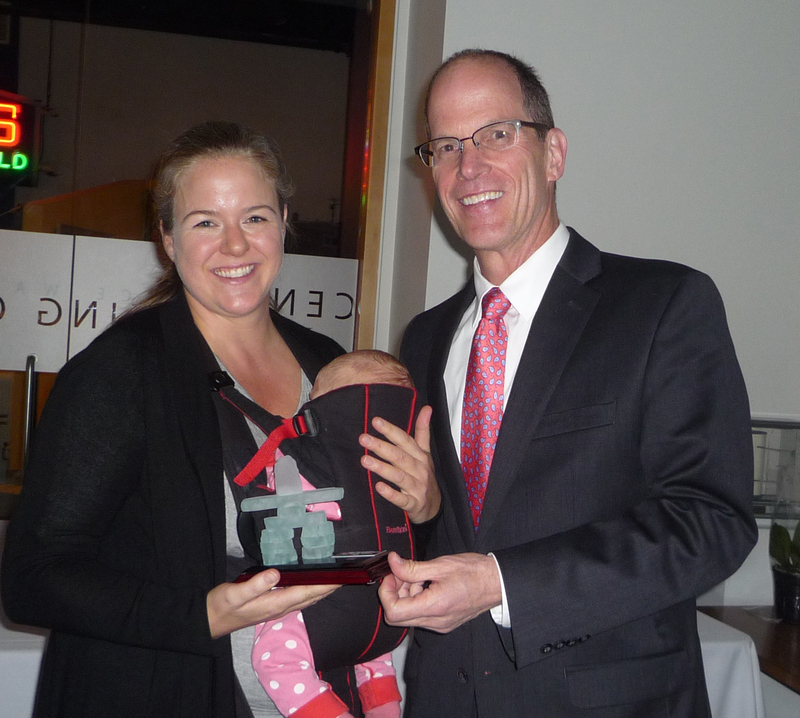 (Dr. Garnis accepting the award from Dr. John Kestle, Head of UBC Surgery, at the WB and MH Chung Research Day dinner [Oct 2013]). James Lawson has joined the Garnis Lab as an MSc student. He previously worked with the Garnis lab as a summer student and we are very excited to have him in the fold. We will have an update describing his research focus soon. Glad to have you working in the lab James! •4 November 2013 • Comments Off on Congratulations Jamil! Belated congratulations to Jamil Manji, who recently completed the successful defense of his MSc thesis (entitled “CYTOKINE MARKERS AS PREDICTIVE TOOLS IN THE TREATMENT OF CHRONIC RHINOSINUSITIS WITH LEPTOSPERMUM HONEY”). Excellent work and we are very pleased to continue to be able to work with you going forward! •4 November 2013 • Comments Off on Congratulations Sara! Belated congratulations to Sara MacLellan for the successful defense of her MSc thesis entitled “Circulating microRNAs as biomarkers for early cancer detection”, a copy of which can be found here. Great work and we are looking forward to continued contributions to the lab in the future! You are currently browsing the The Garnis Lab weblog archives.